As the opening crawl ends, a cutscene begins in which a Republic ship orbiting Taris is under attack by Sith fighters. Within this ship, you're awoken in your quarters by the resulting explosions and alarms, just before the door opens and an ensign of the Republic Fleet runs in and begins speaking to you. Trask: We've been ambushed by a Sith battle fleet! The Endar Spire is under attack! Hurry up – we don't have much time! Trask: Did you fall out of your bunk and hit your head? The Endar Spire is the ship we're stationed on – this ship! You probably don't even know who I am, do you? 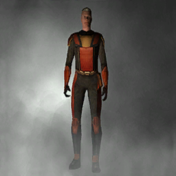 Trask: I'm Trask Ulgo, ensign with the Republic Fleet. I'm your bunk mate here on the Endar Spire. We work opposite shifts; I guess that's why you haven't seen me before. Now hurry up, we have to find Bastila! We have to make sure she makes it off the ship alive! Trask: Bastila's the commanding officer on the Endar Spire. Well, not an officer, really. But she's the one in charge of this mission. One of our primary duties is to guarantee her survival in the event of enemy attack! You swore an oath just like everyone else on this mission. Now it's time to make good on that oath! Trask: You swore an oath to protect Bastila when you signed up with this mission, just like everyone else in the crew! Now it's time to make good on that oath! I know she may not have an official rank in the fleet, but she's the one in charge of this mission and it's our duty to protect her! Trask: I've heard all about your reputation: elite combat training, top in your class. It's no wonder you were hand picked for this mission. Word is the officers haven't seen a recruit with your kind of potential in twenty years. But all that potential doesn't mean a thing if you can't deliver when it counts! We're soldiers, we're trained for combat. Bastila's going to need men and women like us at her side during this attack! Trask: I heard what everyone's saying about you: you've explored the farthest reaches of the galaxy, you've visited planets I've never even heard of. People with your skills and abilities are hard to find; it's no wonder the Republic recruited you for this mission. But now's the time to prove yourself! I know you're a scout and not a soldier, but Bastila needs all troops at her side during this attack! Trask: I know all about your reputation, how you used to smuggle spice and blasters along the Corellian Run. I guess the Republic figured since they couldn't catch you, they might as well hire you. And I'll admit, the Republic is in desperate need of someone with your kind of skills. Desperate enough to overlook your shady past. But now that you've signed on for this mission you're part of the Republic fleet. And Bastila needs all troops at her side during this attack! 1. Okay, let's go help Bastila! 2. 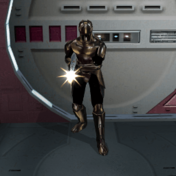 Oath or no oath – I'm heading to the escape pods! Trask: Don't be stupid! You won't stand a chance against the Sith by yourself. We've got to stick together if we want to make it out of this alive. Trask: So hurry up and grab your gear. You need to suit up so we can get out of here. 2. Where can I get my equipment? 2. Can you repeat that? Trask: You can move the mouse to the edges of the screen to rotate the camera. Alternately, moving the mouse while holding down the right mouse button will rotate the camera as well. To move towards the footlocker, hold down the right mouse button and face the camera towards it, then hold down the left mouse button as well to cause the character to run forward. You can left-click on an object to select it. Once the footlocker is selected, left-click on it again to perform the default action on it. The Endar Spire is under attack. Your cabin mate, Trask, has warned you that the Sith have boarded the ship in search of Bastila, the commander of the vessel. You and Trask have to find her before the Sith do. The footlocker also contains a Stealth Field Generator if you spent any points in Stealth. Trask: Come on, we have to hurry! The Sith might already be boarding the ship to try and capture Bastila. Put your equipment on so we can get out of here. 2. How do I equip my items? 2. Can you repeat that? Trask: Use the EQUIP screen to equip the armor and weapons from your inventory. You can access this screen by selecting the EQUIP menu icon in the upper right corner of the screen.Use the mouse to look through your inventory slots. The menu on the right displays items you can equip in each slot. Left-click the mouse to select an inventory slot, then scroll through the available items on the right and left-click to equip one. Trask: Okay, let's move out. We should stick together; you'll have more success with a party than on your own. Trask: Because of the attack this room is in lockdown, but don't worry – I've got the override codes. You'll have to use me to unlock the door. 2. How do I use you to unlock the door? Trask: You always control the leader of the party. You can switch who is the party leader by left-clicking on their portrait in the lower left corner of the screen. Left-click my portrait now to switch me to the party leader, then use me to open the door. Left-click to target the door, then left-click it again with the mouse to open it. Trask: Now that the door's open you better take the lead again. Not only is Trask a Soldier but he's level 3, giving him substantially more Vitality than you at this point, so switching him back to party leader is recommended (although you'll switch back to party leader after each cutscene). Equipping him with your Short Sword is also recommended. Through the door in the south wall of your quarters is a short corridor containing a utility droid. Carth: This is Carth Onasi – the Sith are threatening to overrun our position! We can't hold out long against their firepower! All hands to the bridge! Trask: That was Carth contacting us on our portable communicators. He's one of the Republic's best pilots! He's seen more combat than the rest of the Endar Spire's crew put together. If he says things are bad, you better believe it. We have to get to the bridge to help defend Bastila! There's a map of the Endar Spire and a copy of Carth's message in your electronic journal, just in case we get separated. 2. How do I use my journal? 2. Can you repeat that? Trask: You can access your journal, map and other important menus by clicking on the menu icons in the upper right corner of the screen. You can use the mouse to switch between the menus listed on the tabs at the top of the screen. You've received a message from Carth Onasi, a highly respected Republic soldier. He's ordered all hands to the bridge to protect Bastila. Trask: That door's locked. I don't have the codes to open it, but switch me to the party leader so you can use my security skills to slice into the access panel and open the door. 3. How do I switch you to the party leader again? Trask: You always control the leader of the party. You can switch who is the party leader by left-clicking on their portait in the lower left corner of the screen. Trask: That door's locked, and I don't have the codes to open it. You'll have to use your SECURITY skill on it if we want to get past. 2. How do you use security on a door? Trask: Target the door using the mouse. When you have selected the door, the TARGET MENU will appear. The icons on the TARGET MENU are the additional options you can use on the door. Look at the TARGET MENU and find the SECURITY icon. Remember, the SECURITY icon only appears if you're controlling a character with the SECURITY skill. Once you see it, left-click it with the mouse to use your SECURITY skill on the door. 2. Tell me more about the TARGET and ACTION MENUS. 2. Can you repeat that? Trask: In the lower right of the screen you'll see a list of icons. This is your ACTION MENU. You can select items from this menu by using the mouse. Left-click the icon you want to use to activate that power or item. Clicking on the arrows above and below the icon will cycle to other powers or items in that list. The first icon of the ACTION MENU is for Friendly Force Powers. The second is for Medical Items such as Medpacs and Antidote Kits. The third icon is for Miscellaneous Items such as Stimulants and Energy Shields. The fourth icon is for Mines, and only appears if you have a mine in your inventory and have the DEMOLITIONS skill. 1. Tell me about the TARGET MENU. 3. Can you repeat that? Trask: The icons in your TARGET MENU will change depending on whether your targeting circle is on a door, a container, a friendly creature or an enemy. Left-click the mouse to select a target and bring up the TARGET MENU. Left-clicking on the target again will perform the Default Action on it. The first icon is for combat FEATS. The second icon is for Hostile Force Powers such as Choke and Kill. The third icon is for Grenades. 1. Okay, let's move on. 2. How do I select icons again? Trask: Use the mouse to select the FEAT, power or item you want to use, then left-click to select it. Once the door is open, a cutscene plays in which a Republic soldier is killed by two Sith soldiers outside. Trask: These Sith must be the advance boarding party! For the Republic! COMBAT MODE ENGAGED. PRESS THE DISENGAGE BUTTON TO CANCEL. Until you get to the bridge, all Sith are equipped with a special Blaster Rifle with Damage: Energy, 1, Damage Bonus: Energy, +1 and Attack Modifier: -5 which doesn't inflict more damage on a critical hit. In melee combat, all Sith in the command module equip a special Vibroblade with Damage: Physical, 1, Damage Bonus: Physical, +1 and Attack Modifier: -5 which also doesn't inflict more damage on a critical hit. The nearest Sith soldier on the left only has 1 Vitality, so kill him quickly and then focus on the remaining. Trask: I've got a feeling that won't be our last battle with the Sith. Good thing we have medpacs to heal our wounds. It might be a good idea to use one now before our next battle. 2. How do I use a medpac? Trask: To use an item like a medpac – or another self-targetting item or power – you'll need to know how to use your ACTION MENU. 1. Tell me about the ACTION MENU. 3. Can you repeat that? 2. I know about the ACTION MENU. How do I use a medpac? 2. So how do I use a medpac? Trask: First, left-click on their portrait to take control of the injured character. Use the mouse to look through the Medical Items in the ACTION MENU until you see “Medpac” in the information box. Notice the up and down arrows on this icon. This means you have more than one available option for this icon. You must choose between a medpac and an advanced medpac. Use the mouse wheel to scroll up or down to switch between your medpac and your advanced medpac. Left-click the mouse to use the selected item on the character you currently control. Just remember that you have to actually be hurt for a medpac to work. You can't use it when you're uninjured. However, do not bother healing while in the command module, because once you and Trask are reduced to 1 Vitality you will remain conscious and take no further damage. You cannot be killed (yet)! The door at the east end of the corridor remains locked until both are killed, and leads to a small room with another two Sith soldiers. Search the Republic soldier remains just inside the entrance to the right, the footlocker further along the south wall and the metal box against the north wall. You should also search the remains of those killed when they're left behind at random. Opening the east door triggers a cutscene of a battle at a junction round the corner to the north, which ends when one of the three surviving Sith soldiers throws a Frag Grenade to kill the last two Republic soldiers (and one Sith soldier: bear this in mind when using them yourself). Once this ends, the door has locked behind you. ...since when you approach the junction, two reinforcements come running around the corner from the north corridor. 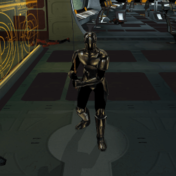 These two are identical to the Sith in your second encounter except each has a Medpac in their inventory, which they'll use when reduced to less than 50% Vitality, so you and Trask should focus on one at a time. 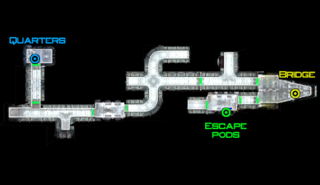 After returning to the junction and turning east, you'll hear the sounds of a lightsaber battle as you approach the door at the end of the corridor. Opening the door triggers a cutscene of this battle between a Jedi and a Sith apprentice. Trask: It's a dark Jedi! This fight is too much for us – we better stay back. All we'll do is get in the way. Although the Jedi defeats the Sith apprentice, she's killed by a subsequent explosion. Trask: That was one of the Jedi accompanying Bastila. Damn, we could have used her help! Before you can search the Jedi's remains, two Sith soldiers run around the corner of the intersection ahead from the cul-de-sac to the north; they're identical to the Sith in your second encounter, except the one on the left has 13 Vitality and once again each has a Medpac they'll use when reduced to less than 50% Vitality. Trask: The bridge is just beyond that door. You better equip your melee weapon. There isn't much room on the bridge, and it's suicide to use a blaster in close quarters. I should equip a melee weapon, too. Either that, or I'll have to stay back and use my blaster. 1. Okay. 2. What if they have lightsabers? Trask: Your melee weapon is made using a cortosis weave. It's strong enough to stand up against anything, even a lightsaber. Experience is also received when any of the surviving two Sith soldiers fighting two Republic soldiers on the bridge itself are killed by explosions, although this is not recorded in Feedback. There's also a backpack in the right corner just inside the entrance. Trask: Bastila's not on the bridge – they must have retreated to the escape pods! We better head that way too. The Sith want Bastila alive, but once she's off the ship there's nothing stopping them from blasting the Endar Spire into galactic dust! You've reached the bridge, but Bastila is nowhere to be found. She likely made her way to the starboard escape pods. If you want to get off the Endar Spire alive you should do the same. The entrance to the bridge now closes and locks if you're inside. 1. Okay. 2. How do I level up? Door: Left-click on the CHARACTER RECORD menu icon in the upper right corner of the screen. Then follow the instructions given on the screen. If you don't have enough experience points (XP) for level 2, it will be increased to 1000 to achieve this. However, you'd have 1275 XP if you'd killed all Sith soldiers rather than running past some of them. Trask: There's something behind here. Trask: Damn – another Dark Jedi! I'll try to hold him off, you get to the escape pods! Go! Trask has now left your party, never to return, but any items he equipped are automatically transferred to your inventory. The door locks behind him, leaving you no other option but to open the door in the south wall and enter the starboard section. This page was last edited on 16 April 2018, at 20:38. This page has been accessed 24,558 times.